Get kids into the spirit of Earth Day when they make their own Earth Day craft. This Earth Day sign can be displayed proudly as a reminder of Earth Day 2014, and to let others know your family is Earth Day prepared! Using just a few basic materials, you can craft your own Earth Day craft for kids in just minutes. When done they can be displayed anywhere. So take a peek and see how to make your own. This is an easy and budget friendly Earth Day craft that can become a new family tradition. If your kids need a little help understanding why this day is so important, check out our books to teach kids about the environment. We were able to find all of these materials at our local craft supply store. They have a huge variety of colored paper plates to choose from (as do most dollar stores) as well as felt sheets to choose from. 1. Begin by laying your paper plate flat so the blue side is exposed. 2. Begin cutting out sections of green felt or green construction paper. You want them to look like land mass, so cut out just random shapes by eye. 3. You can now begin gluing the green felt to the plate. Arrange them in different ways with space in between each other so they start to look like land and water, or like a globe would. 4. With your marker, write “Earth Day 2014″ on the plate. You can write directly on it. You can attach a piece of string to hang your Earth Day sign, which is a great idea if doing this craft with a whole classroom. Or, just add a little bit of tape to the back and hang it on the wall. Either way, this is a fun and frugal way to celebrate Earth Day and all of the fun that comes with it. 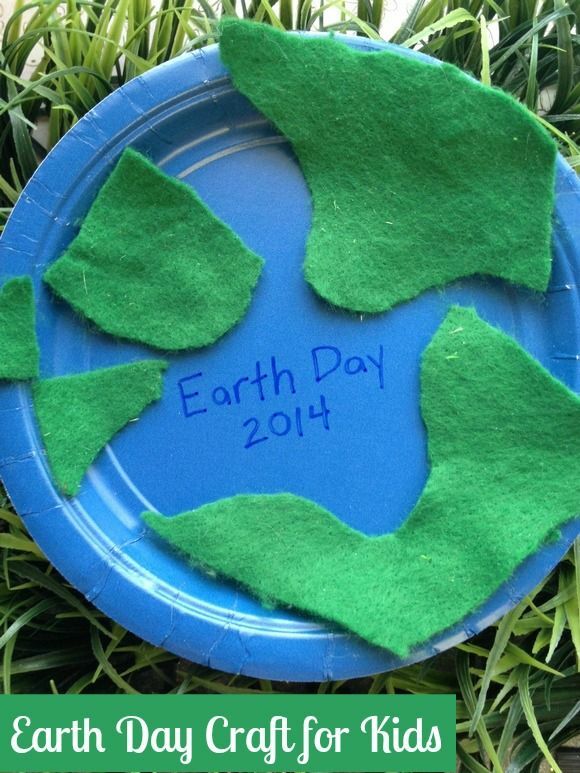 Gather your supplies and get started on this fun Earth Day craft for kids! How do you celebrate Earth Day? Need more ideas? Check out our great Earth Day activities for kids! Very cute, I can never find the right colored paper plate when I need it. That blue is perfect! Great idea and a cute project! Definitely easy enough to do! Wow! This is a super cute idea! My kids would love to make one of these! Thanks for the reminder. I forget that Earth Day is almost here. Fun Earth Day Sign <Loved it! I love this, so inexpensive to make as well as cute! This would be a great craft project for my girls. They’d love it and the materials are things I already have around the house. extremely frequent, never fails to awaken a soul-crushing sadness deep within our minds. up with my movements. My girlfriend managed to stay sound asleep through this fiasco, and looked peaceful as ever. I glanced at the clock, and like many other mornings before this one, realized my scramble to wake up and get going was fruitless. I was up early, and there was no need to rush. guaranteed, top dollar sales position since the day I exited my mother’s womb. wealthy upbringing, and well-structured, loving parents. to school, and sports, and rarely ever distracted by girls. counterproductive activities my peers got off on. what crime his hooligan son got himself caught up in now. country with the small amount of money they made selling these “art pieces”. I started to wonder if Andy had the right idea after all. his hand on my back and gave me that classic, fatherly grin. “I’ve got a project for you.” I cringed. event for inner-city children with no dental insurance. To read more, register on my site to receive the free kindle or whatever other format book! Love this craft for Earth Day. The kids will love it! Thanks! That is a creative craft. I like to make things with kids! This would be a great craft for my kids! Thank you for this great craft idea! Great craft idea for the kids. Thanks! Adorable idea and super easy! Great post. I wass checking constantly this blog andd I amm impressed! Very useful info specially thhe last part I care for sufh info much.